Established in 1982, the Fifth String has been the cornerstone of the acoustic music scene in the Sacramento Valley for over 30 years. We are committed to providing the best selection of world-class stringed instruments, music books, and accessories at the best prices, delivered with the friendliest, most knowledgeable service in the Valley. We now offer online acoustic guitar lessons. 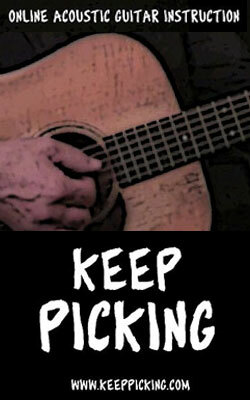 KeepPicking.com offers a proven, systematic approach to learning traditional bluegrass styles and techniques. Our process has been forged over 25 years of in-person instruction as Sacramento, CA's renowned Fifth String Music Store. Come by and see us or give us a call at 916/442-8282. Between Alhambra and Folsom Blvds. 2 blocks east of Business 80 in Downtown Sacramento. Friday - 10:00 a.m. - 6 p.m.
Saturdays, 10:00 a.m. - 5:00 p.m.
Saturedays from 11 a.m. - 12 p.m.